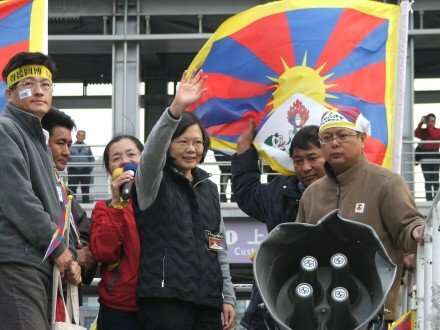 Following the overwhelming victory of the Taiwanese President elect Tsai Ing-wen representing the Democratic Progressive Party (DPP) in the recent presidential and general elections in Taiwan, the Central Tibetan Administration leadership congratulated the first female leader of the island. The Tibetan Prime Minister Dr. Lobsang Sangay, in his congratulatory note, likened the development as “a reflection of the robust democratic institution” in Taiwan and also “a source of great inspiration for the Tibetan people”. “Your commitment, visions and willingness to serve the people of Taiwan have won the trust of the majority. As you embark upon the responsibility of the first female president of Taiwan, I wish you all the luck and success in your endeavors. “Moreover, as a longstanding friend of the Tibetan people, you have repeatedly expressed your concern at the deteriorating situation inside Tibet under Chinese rule for which we are truly grateful. We hope you will continue your pivotal support to peacefully resolve the Tibet issue as the President of Taiwan,” the Harward graduate who swept the preliminary polls in October last year by a huge margin. The Tibetan Parliament n Exile also put forth an official note which mentioned, “On behalf of all the Tibetan people in and outside Tibet, the Tibetan Parliament-in-Exile would like to heartily congratulate Your Excellency and your party on this historic victory. It is also a landmark in the democratic history of Taiwan that Your Excellency is first female elected to the office of the Presidency. In the absence of the Speaker of the TPiE who has as per the election requirements stepped down, Mr Topgyal, the Tibetan Parliament secretary touched upon the longstanding relationship between the DPP party, Tsai and the Dalai Lama. He also pushed for a greater political help from the new government. “We sincerely urge Your Excellency to consider the issue of Tibet as one of the core issues of new government in Taiwan under your leadership,” he wrote. Tsai-led Democratic Progressive Party (DPP) wants independence from China, contrary to what the pro-China and the out-going government was trying to achieve with ‘unification goal’. China has reportedly blocked Tsai's account on Sina Weibo, dubbed as China's Twitter, immediately as results started coming out. Searches for Tsai Ing -wen in Weibo, China's biggest search engine, have also been blocked.